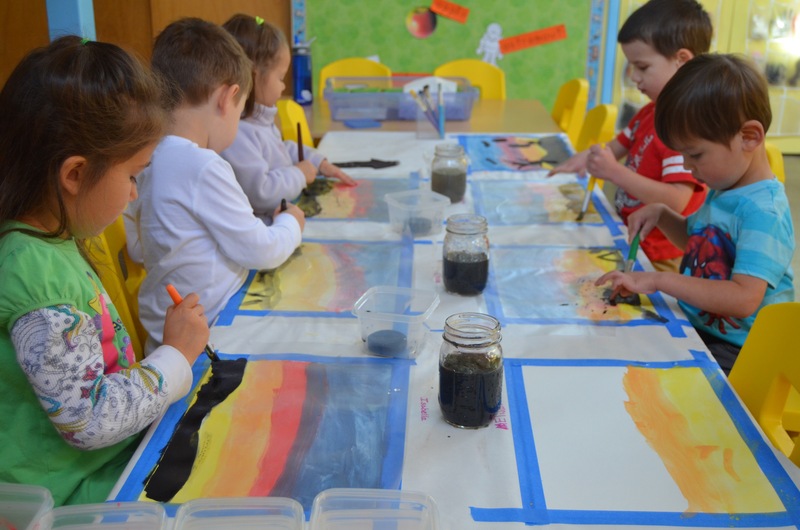 During January the children learned about cold climates and worked with the story “A Whale of a Tale” from Twenty Tellable Tales compiled by Margaret Read MacDonald. 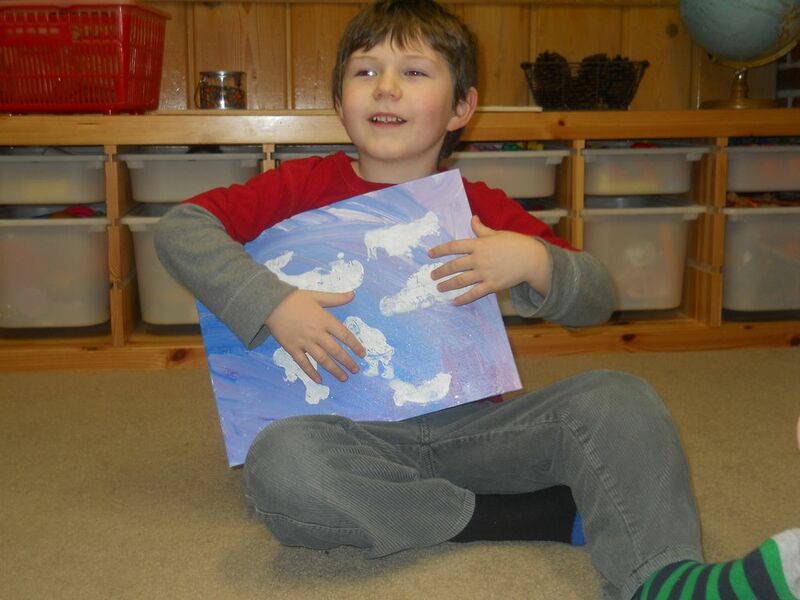 This story originates from the Eskimos. At the beginning of the month children looked at the globe to see where Eskimos live and then where they live. 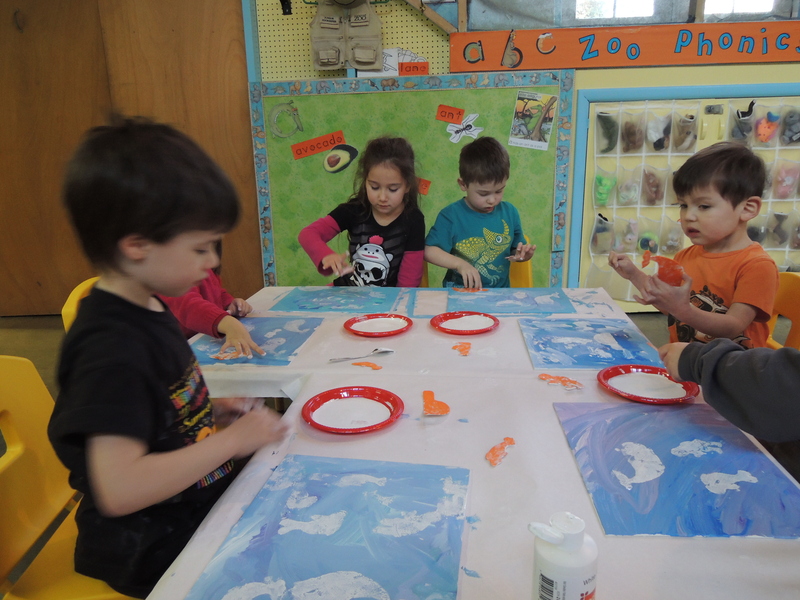 Our class talked about weather and animals found in arctic climates. 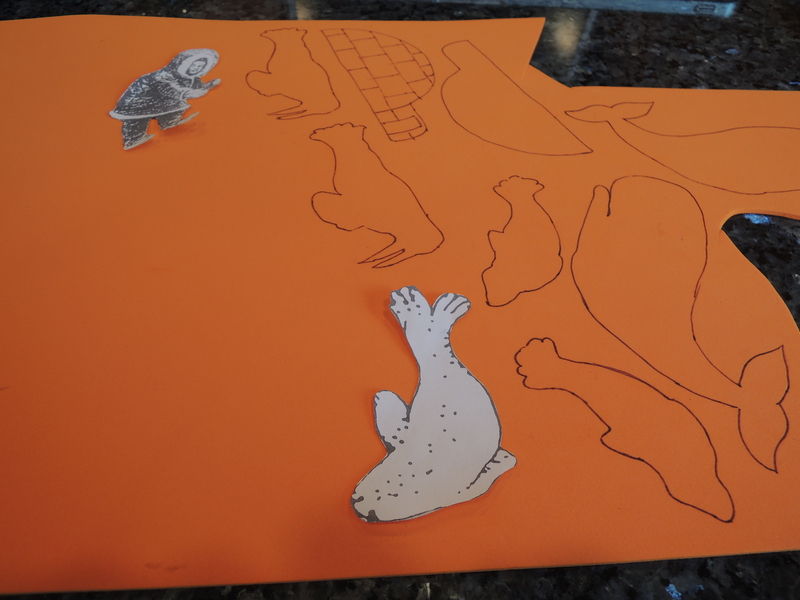 Teachers told the story using flannelboard figures copied from prints in the book. Children also learned Chinese vocabulary related to the story. 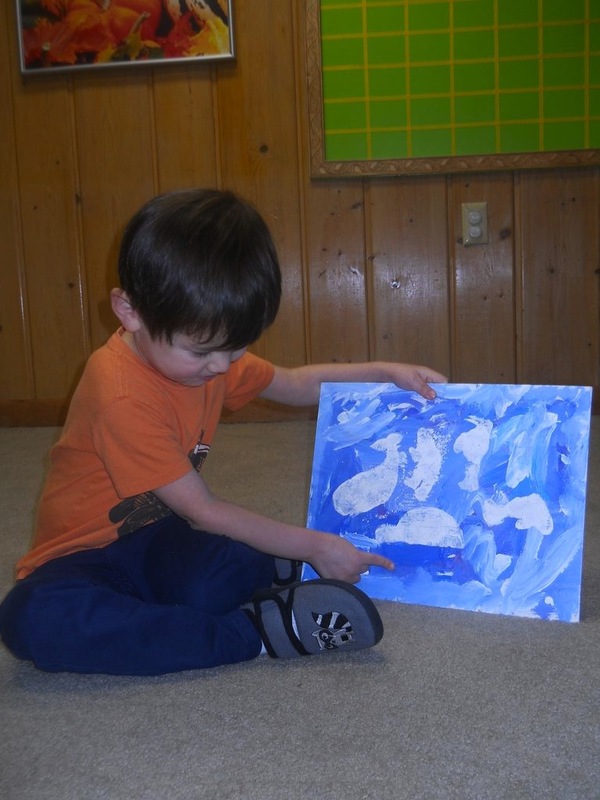 A winter painting was created to go along with the story. 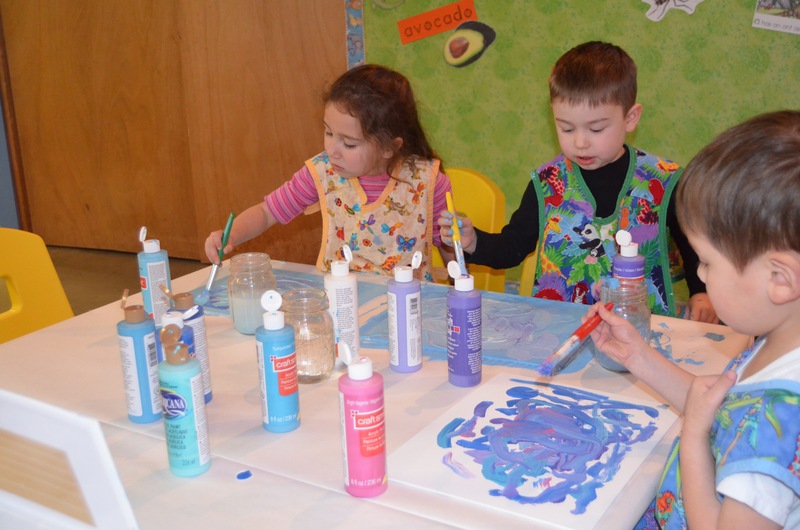 Children were given a canvas on which to squirt dots of acrylic paint in cool colors to create a winter background. 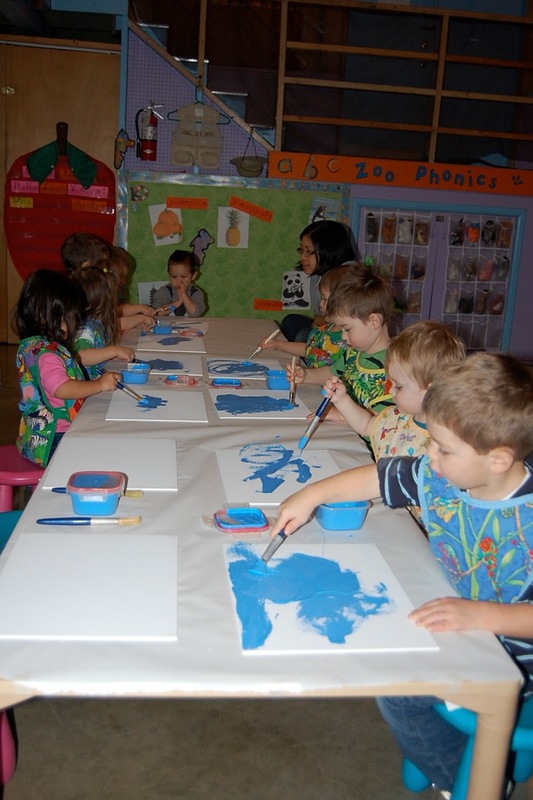 The paints were then mixed to produce the background for the story figures to be printed onto. 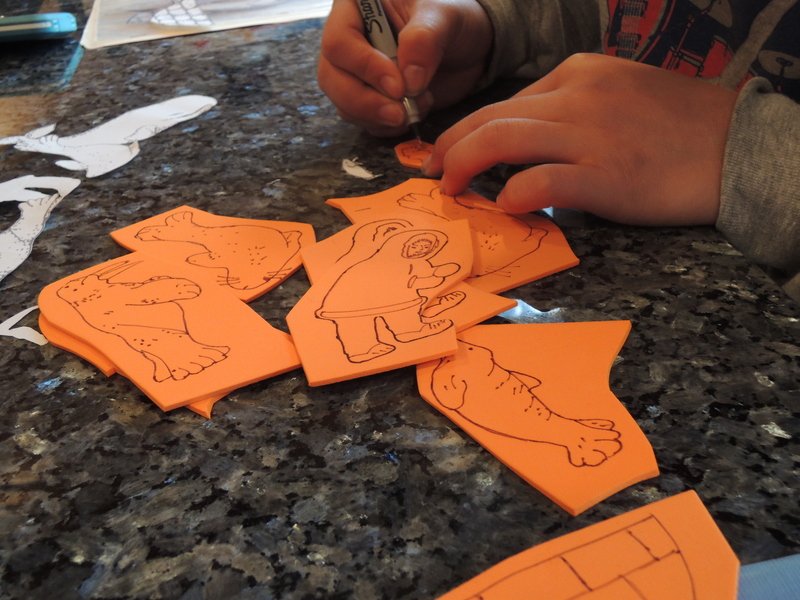 Misty-Jade and I made stamps from the story figures. 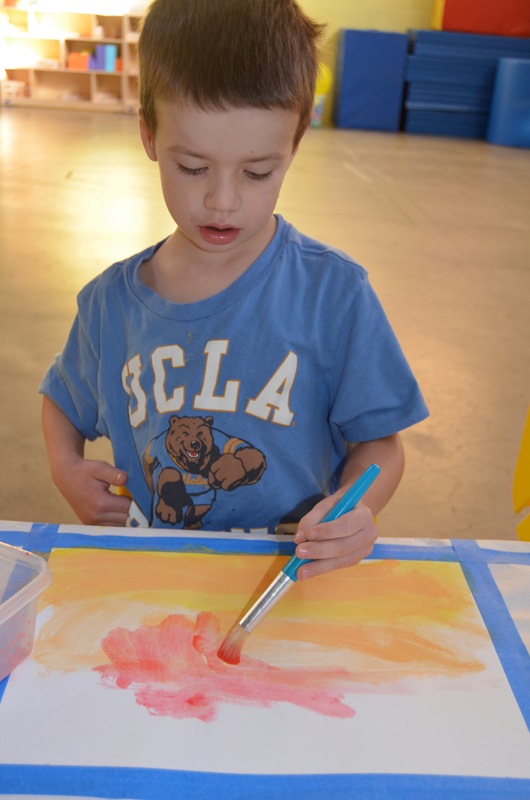 We traced the prints onto foam sheets, drew in the details, and then traced the details with an Exacto knife. 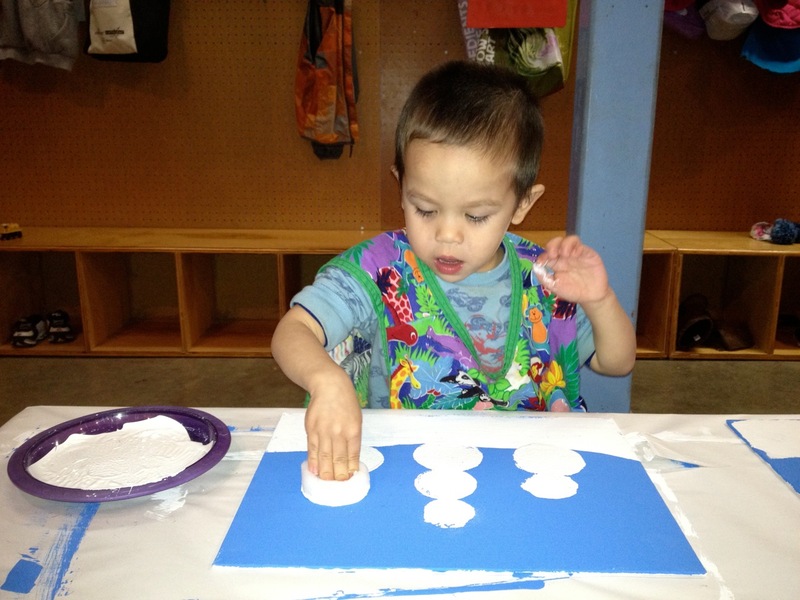 Stamp pads were made using two layers of fabric interfacing cut into circles to fit inside a plastic picnic plate. 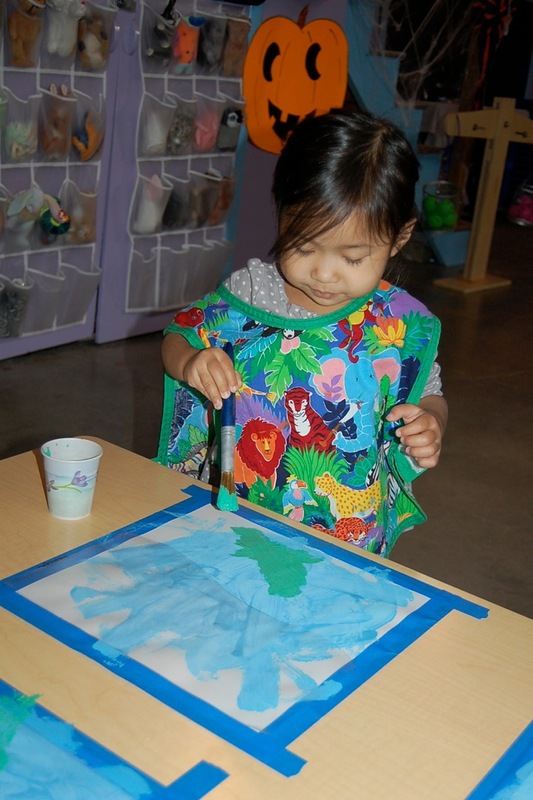 The fabric was soaked with water and then white acrylic paint was poured on top and spread out. 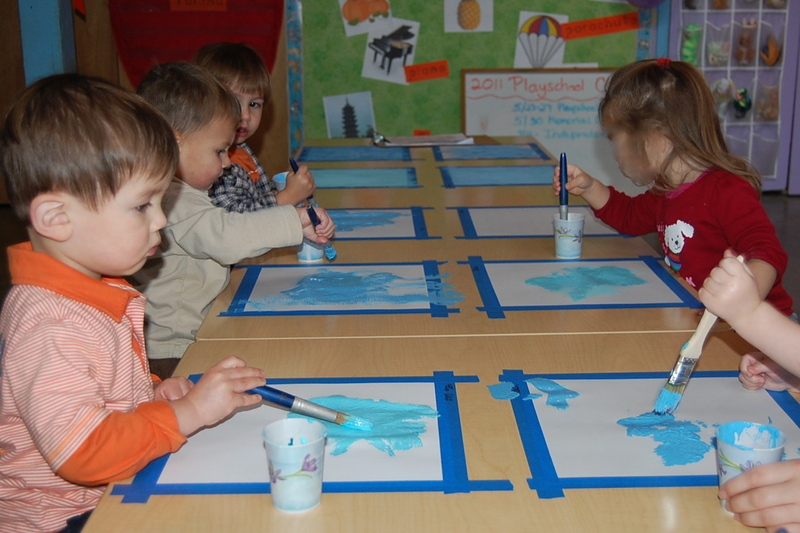 Children stamped the figures onto their winter paintings. 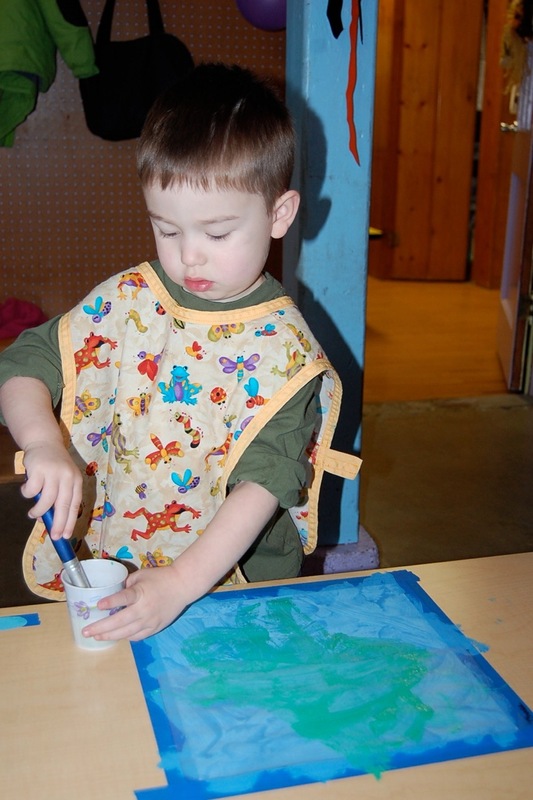 After the paint dried the children applied a coat of Mod Podge diluted with water to the pictures. 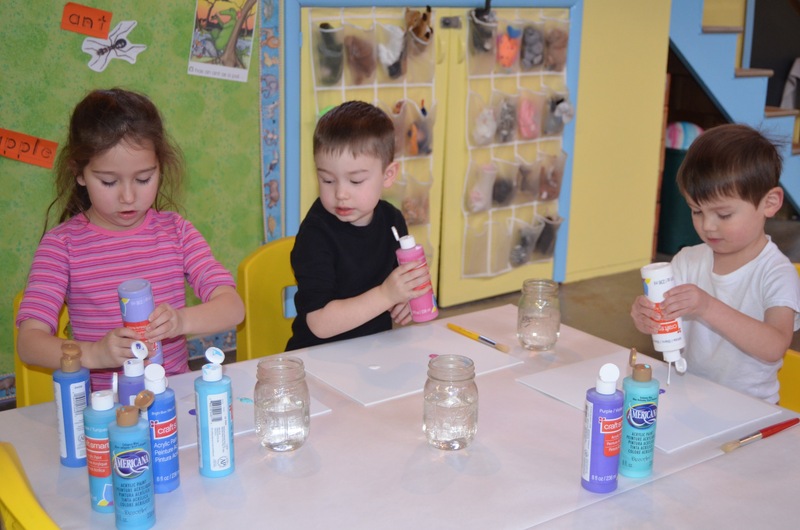 Some irridescent glitter was sprinkled over the Mod Podge for snow. 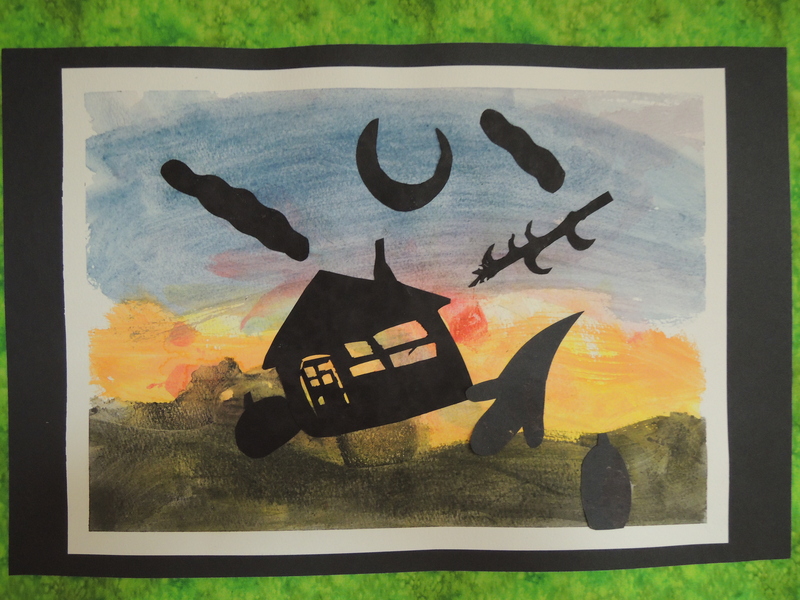 Last week the children retold the story during circle time using their pictures as a guide. They were all able to include the Chinese vocabulary they had learned. December has just begun and we’re all very busy! 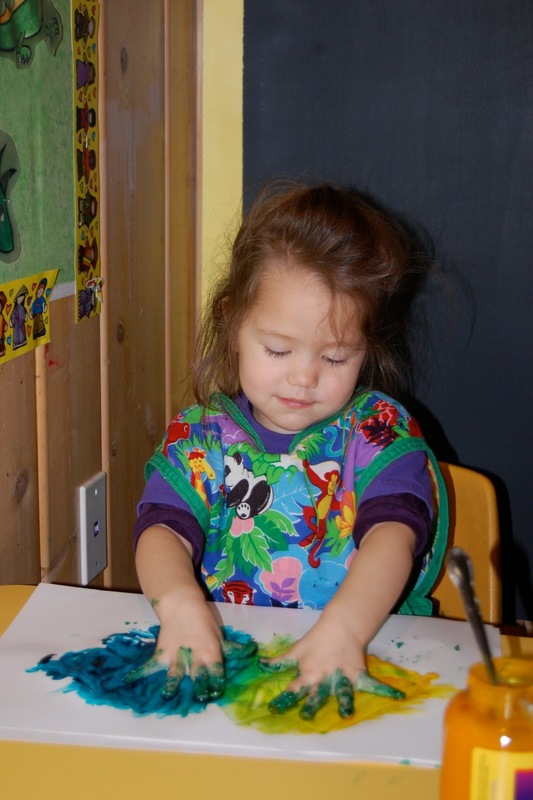 The children have completed many activities already and there are so many more to do before Christmas vacation begins. 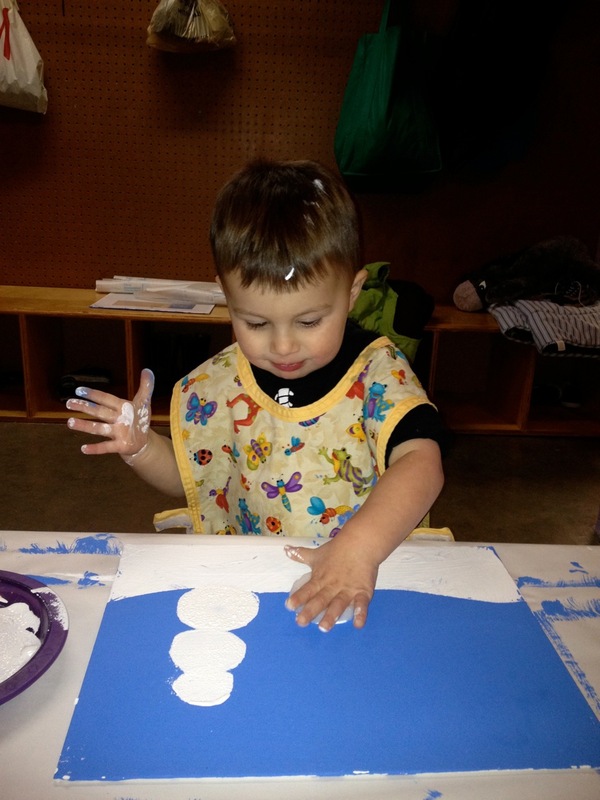 The winter sensory tub (inspired by Teach Preschool) has been a big hit with all the children. Even the adults can’t keep their hands out of it! A tub was filled with plastic frosty snow. 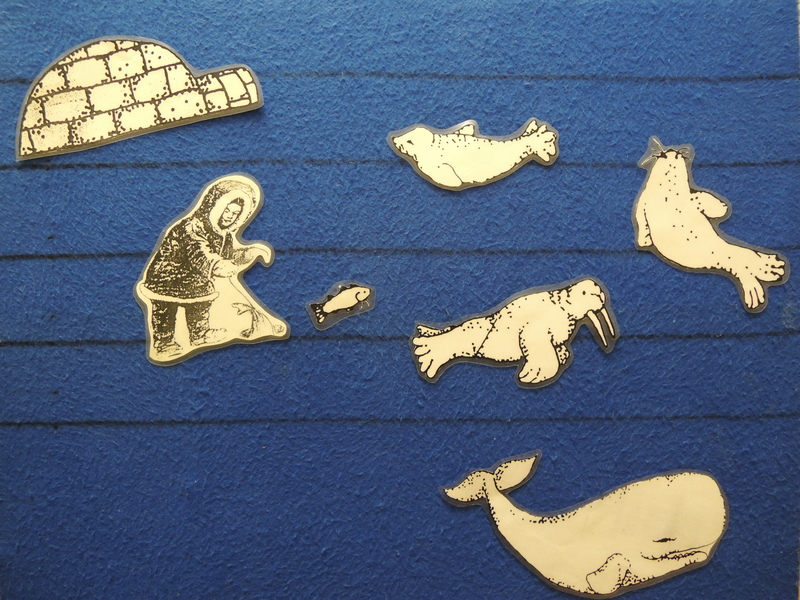 Penguins and an iceberg from a game we have were added to the snow along with clear and blue acrylic ice cubes. Some wood scoops and a couple wire Christmas ornaments were added. The blue confetti snowflakes add some cool color to the tub. We’ve had a couple incidents where the children have thrown the snow up to watch it fall, but who wouldn’t be tempted to do that? 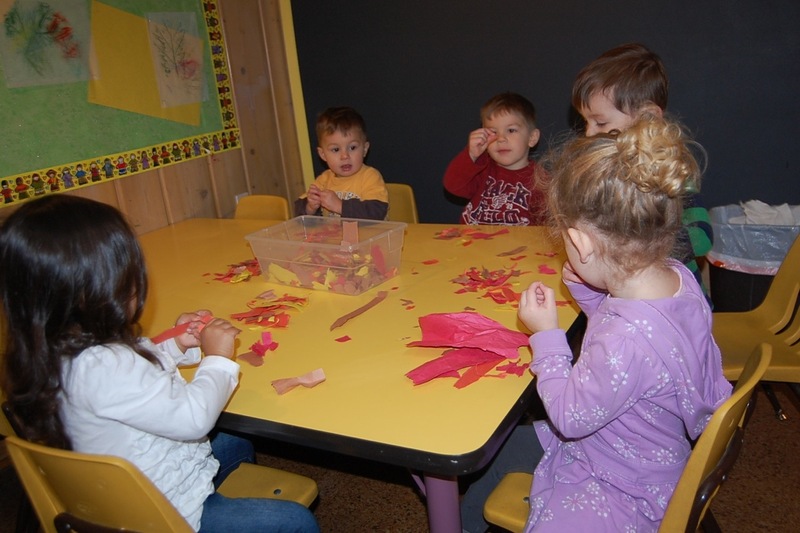 The children continue to learn Chinese with Gao Laoshi and are beginning to learn to count to 20. A couple felt Christmas trees were attached to the wall and velcroed pom poms were set out in a dish. 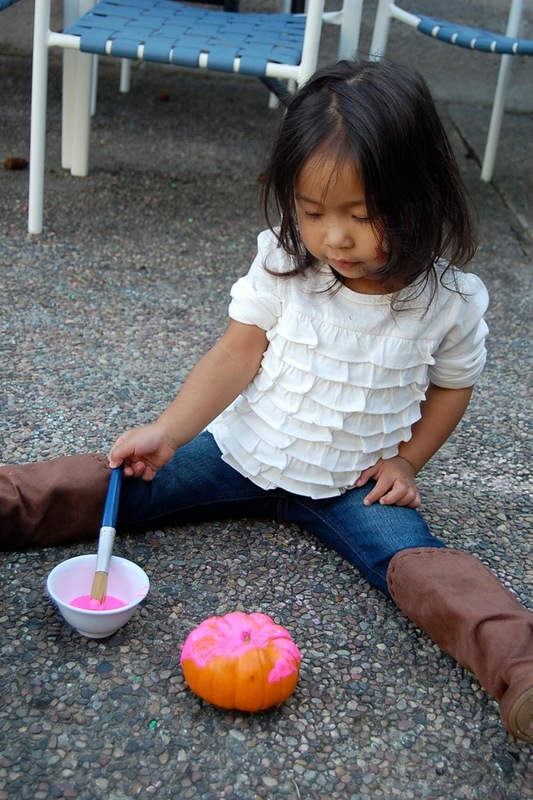 This activity helps children to practice counting as well as learn Chinese color vocabulary. Gao Laoshi has started introducing some simple Chinese characters to the children. They’re beginning to write numbers. 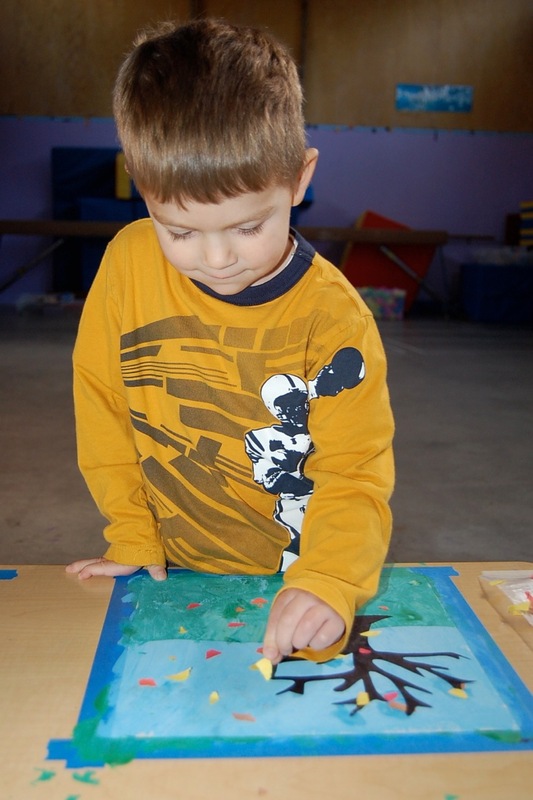 Christmas shaped erasers have been set out at the math center for children to work on one-to-one correspondence. 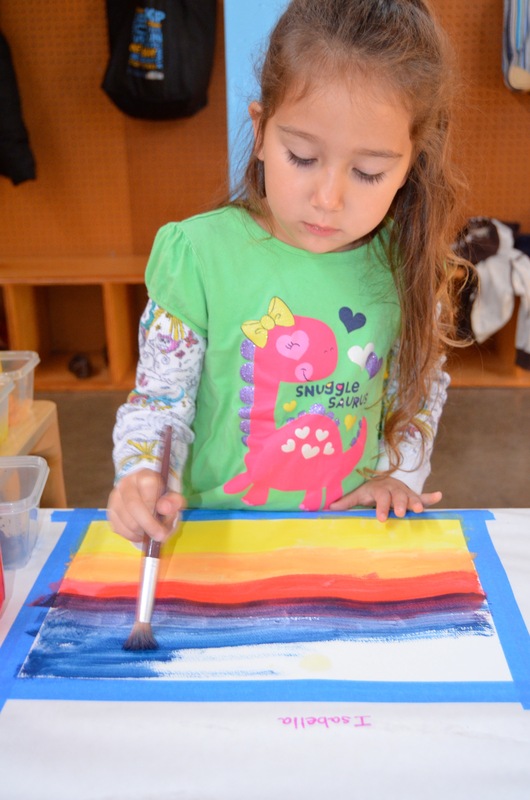 Colored craft sticks were also set out at the math table. 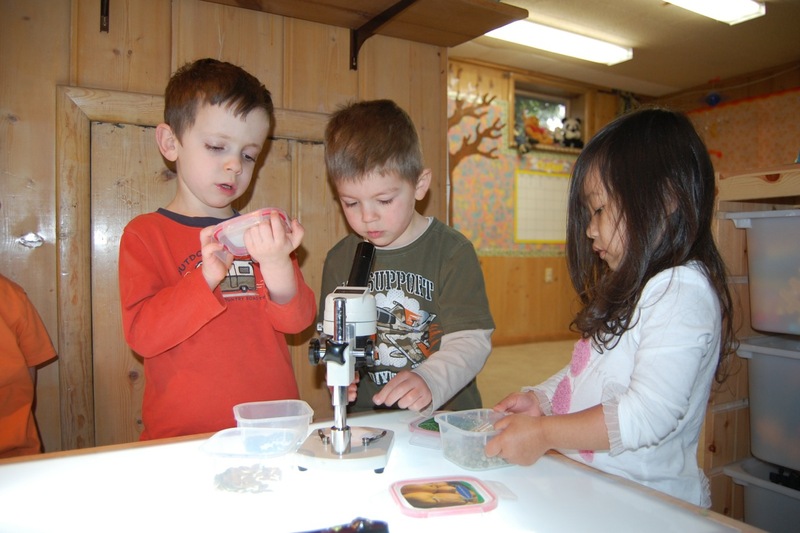 Velcro dots were attached to the ends on both sides so that the children can build geometric shapes with them. 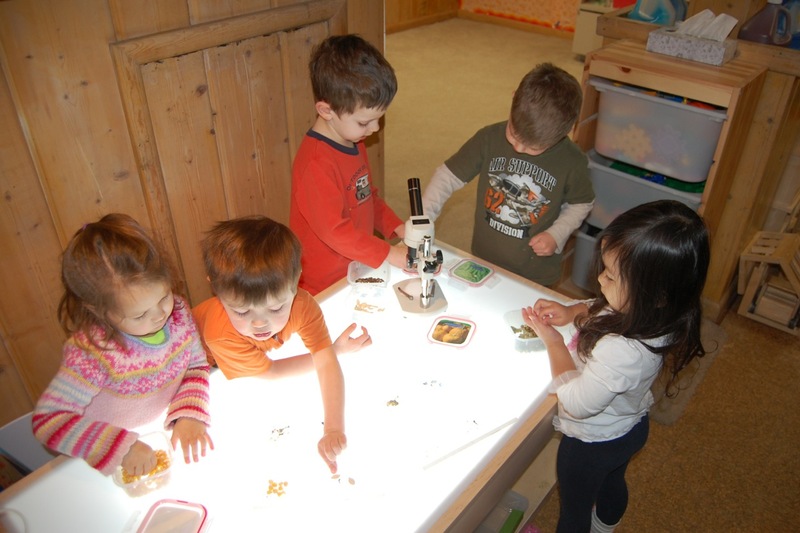 A basket of clear and different shades of blue stones have been set out at the light table for children to build with. 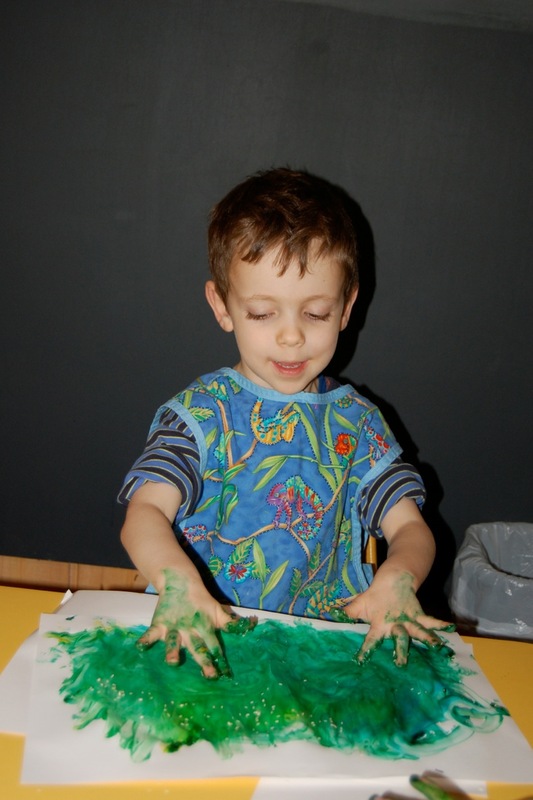 Finger painting on foil was a new experience for all the kids. 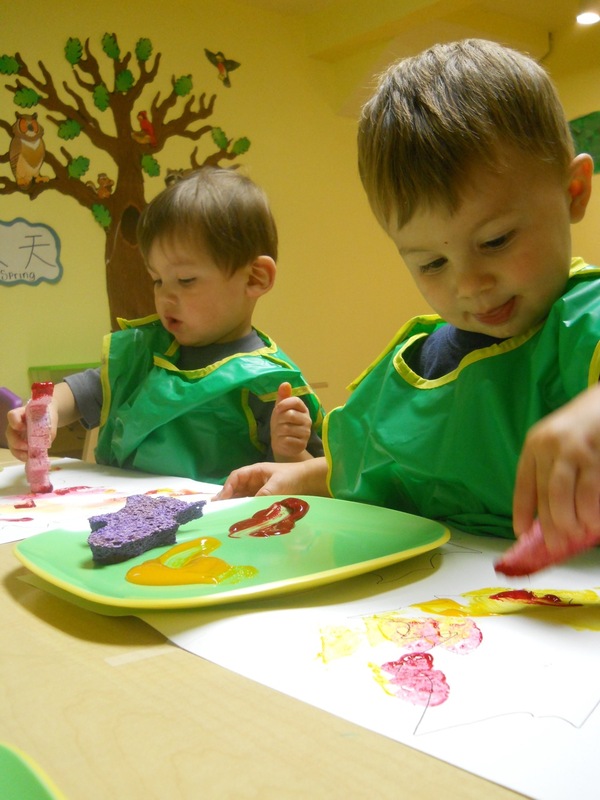 They enjoyed seeing the shiny foil through the paint. 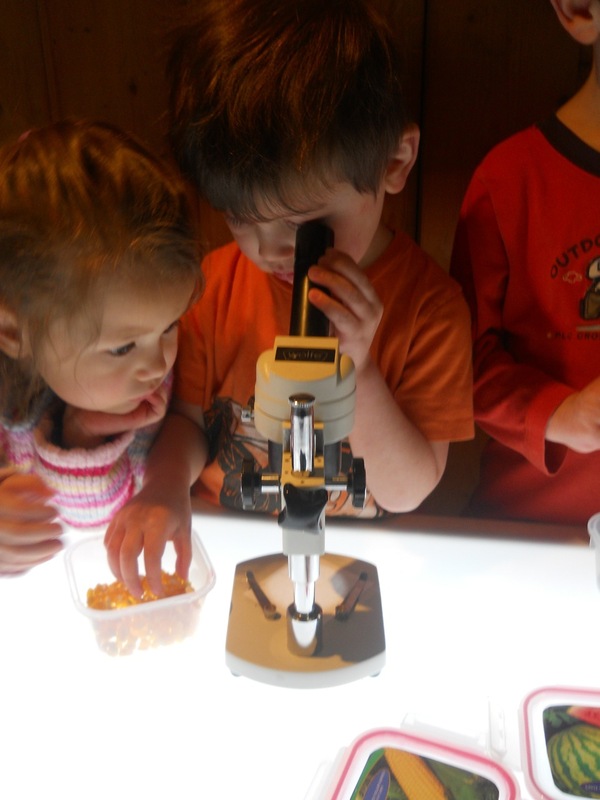 This week the preschoolers have been studying seeds in more depth. 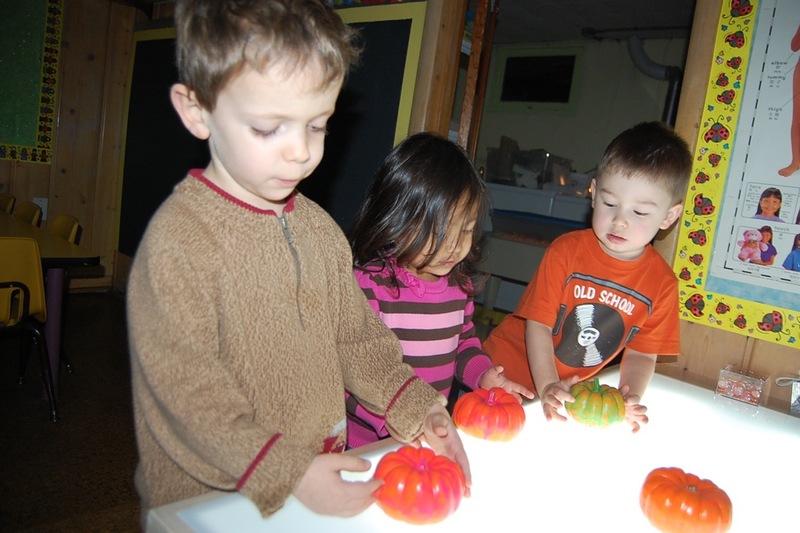 Transparencies with pictures of corn, pea, watermelon and pumpkin seeds were set out on the light table. 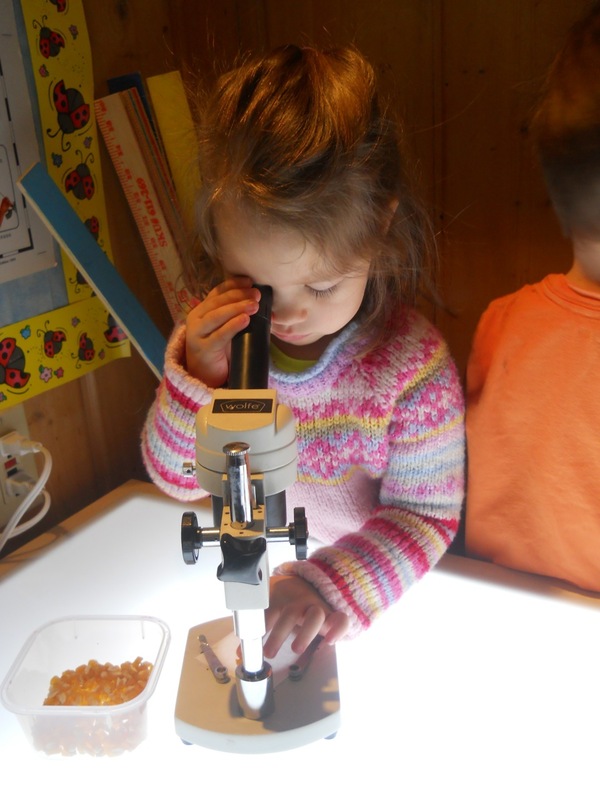 Boxes containing the same seeds were available for the children to match with the pictures. Pictures of each plant were taped to the top of the boxes. 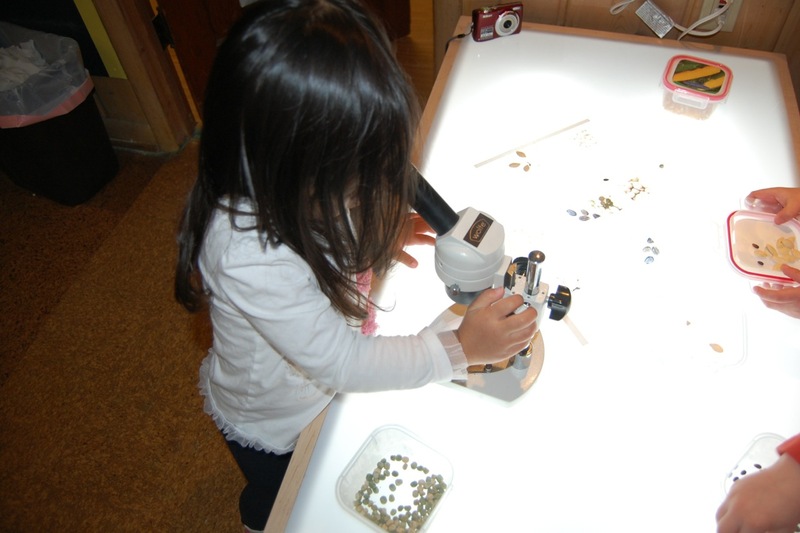 The microscope was used to further examine and compare the seeds. 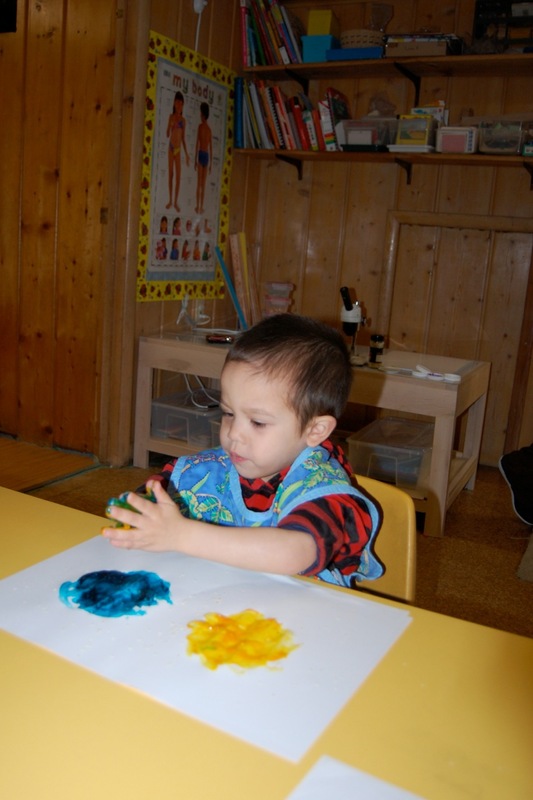 Preschoolers are heavily dependent on their senses for learning, so the seed activity was extended through fingerprinting. 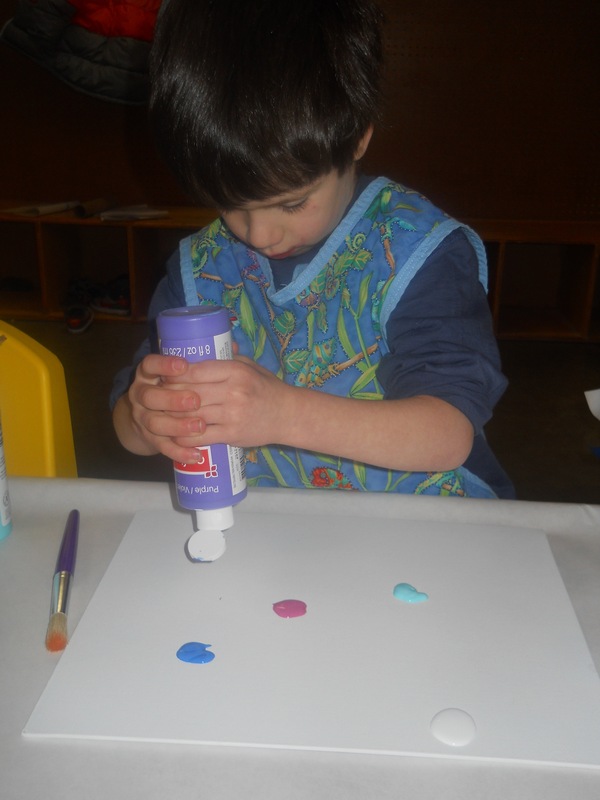 Sesame seeds were added to the paint. 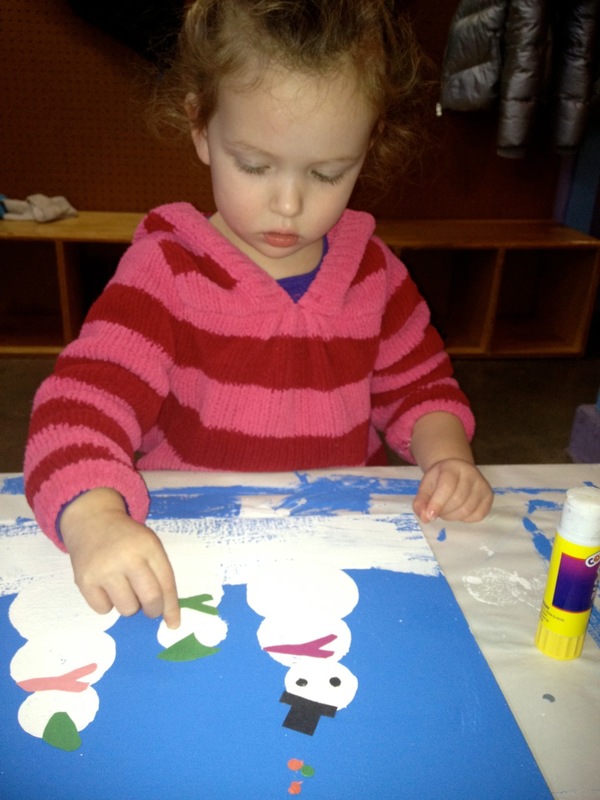 Both the toddler and preschool classes made family snowman wall hangings for their parent’s Christmas gifts. The family names have been edited out of the photo. 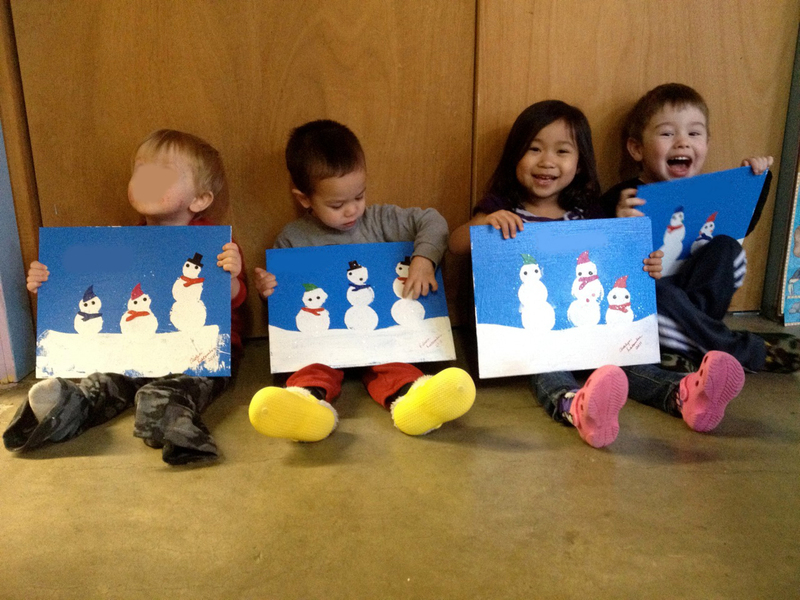 I found this idea at that artist woman: Family Snowman Portraits. 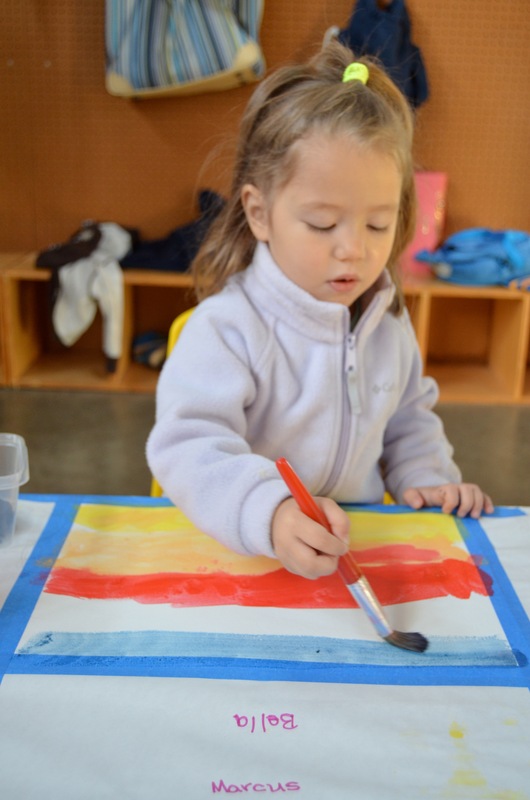 Gail did this project with second graders, but I thought we could try it with our preschoolers. 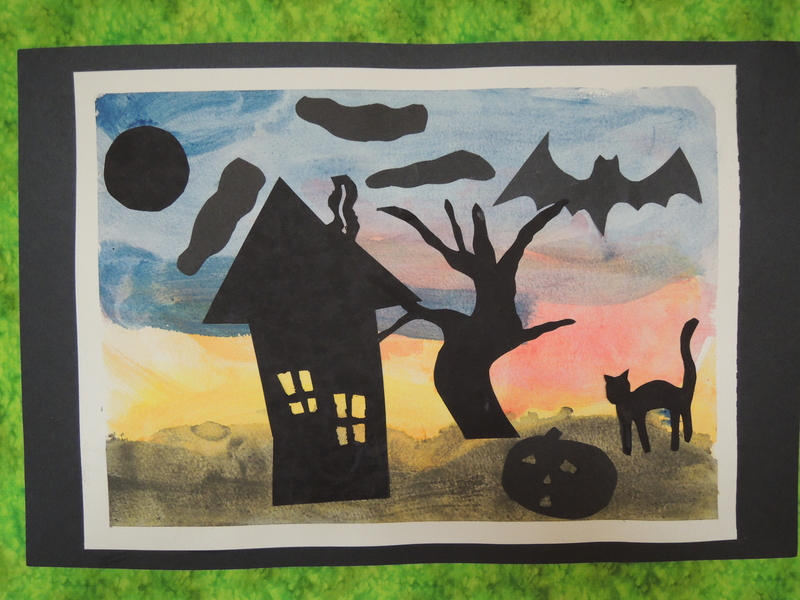 It took two weeks for all the kids to finish the project, but it was really worth the effort! 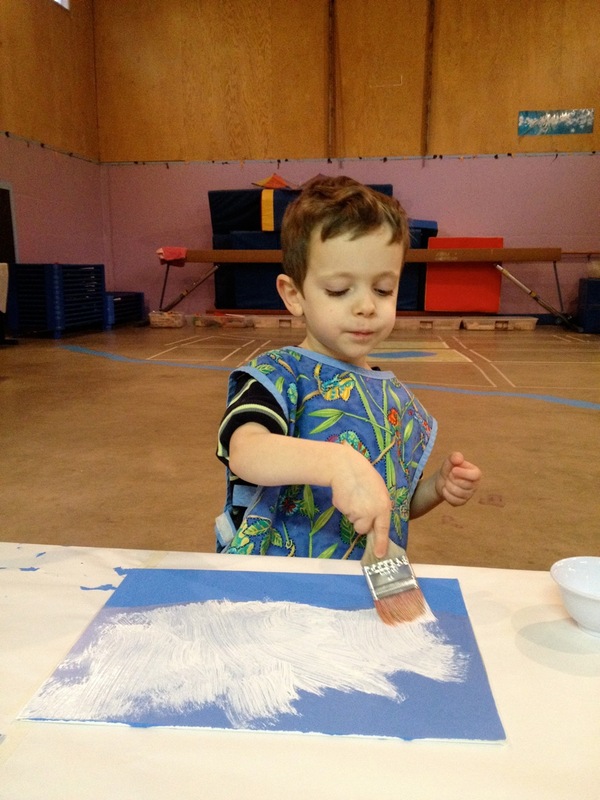 Blue and white acrylic paint was mixed to get the perfect blue sky color. 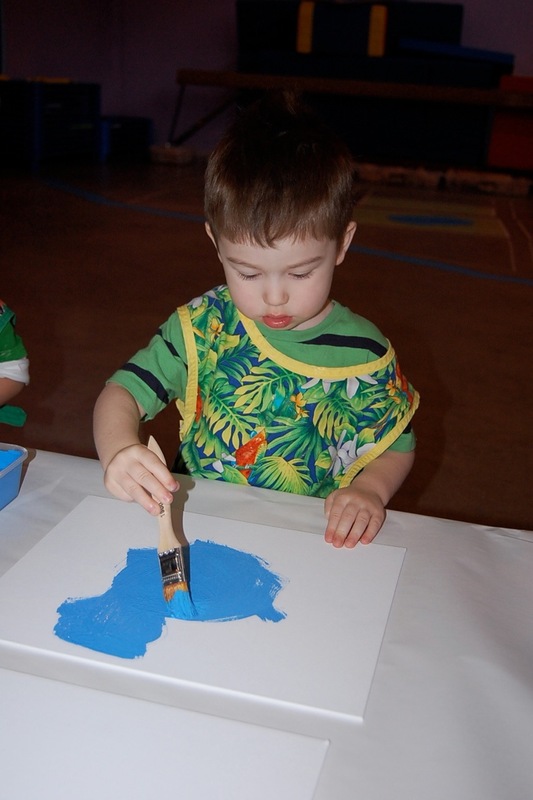 The children painted the entire 11″ x 14″ canvas (purchased at Michael’s) blue. 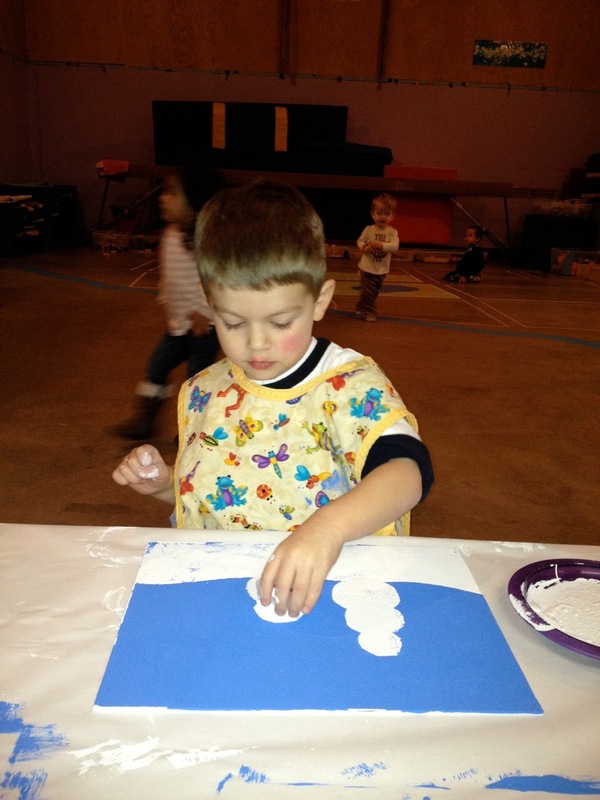 A contact paper mask was placed over the blue allowing the children to paint the snow at the bottom of the canvas. 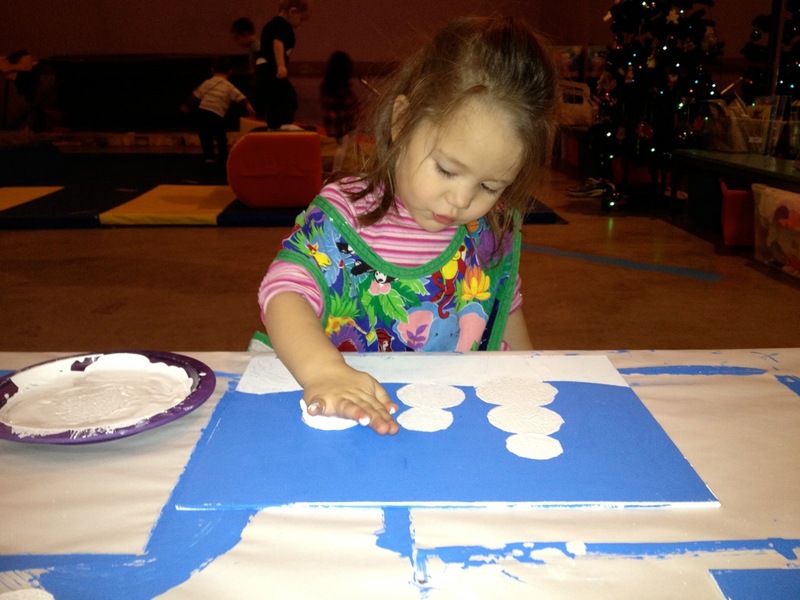 The teachers cut circles out of foam purchased at the fabric store and then the children created a snowman for each member of their family. 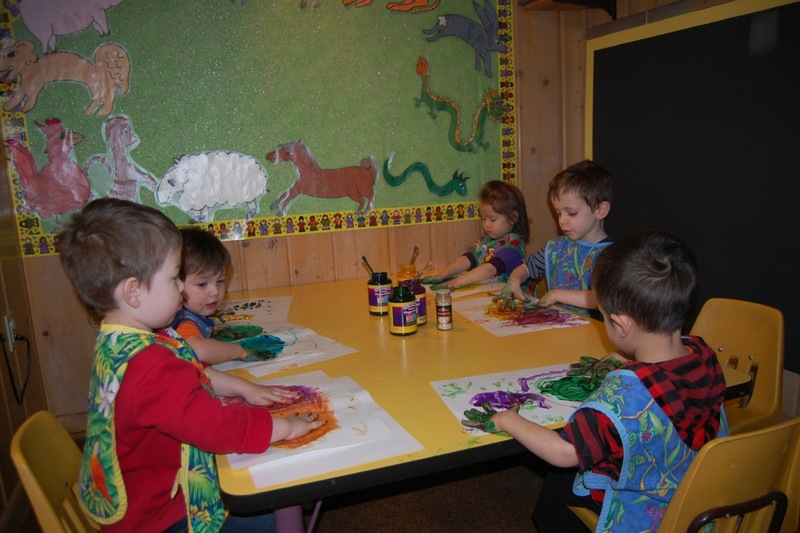 Construction paper clothing was added to each snowman. 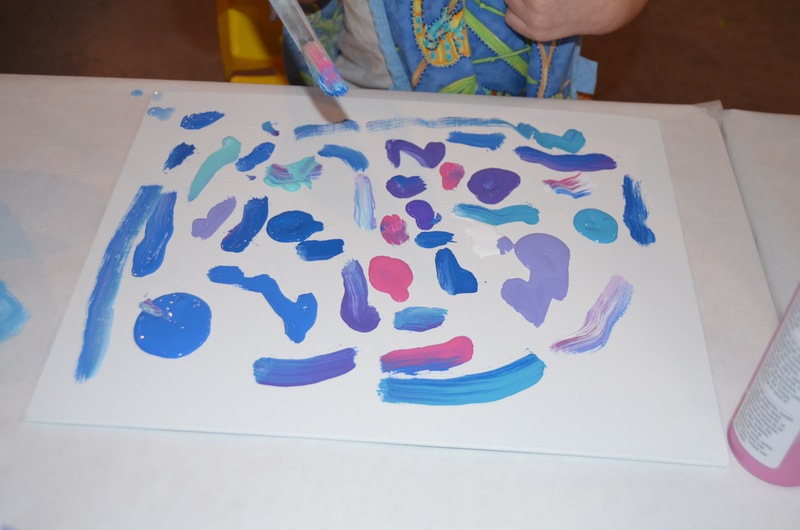 Family names were added to the canvas and then covered with a clear coat of Mod Podge. Some glitter was sprinkled over the wet clear coat to add some sparkle. 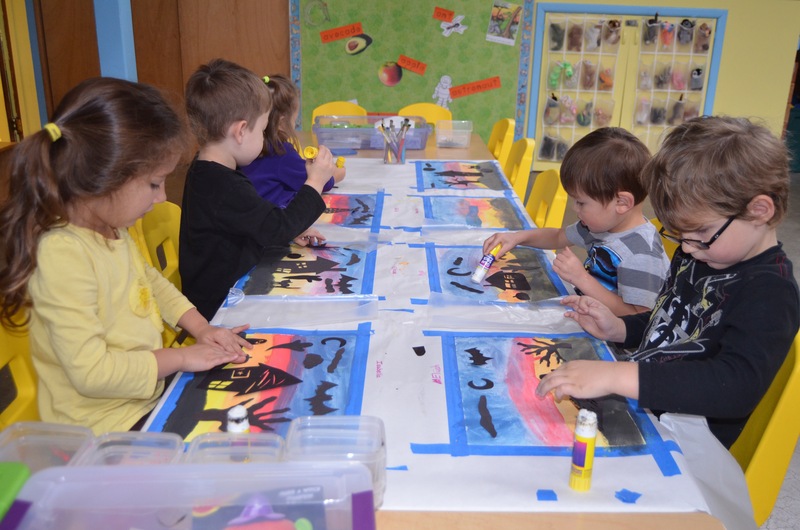 I really loved the way this project turned out and will do it again in a few years with another group of preschoolers. 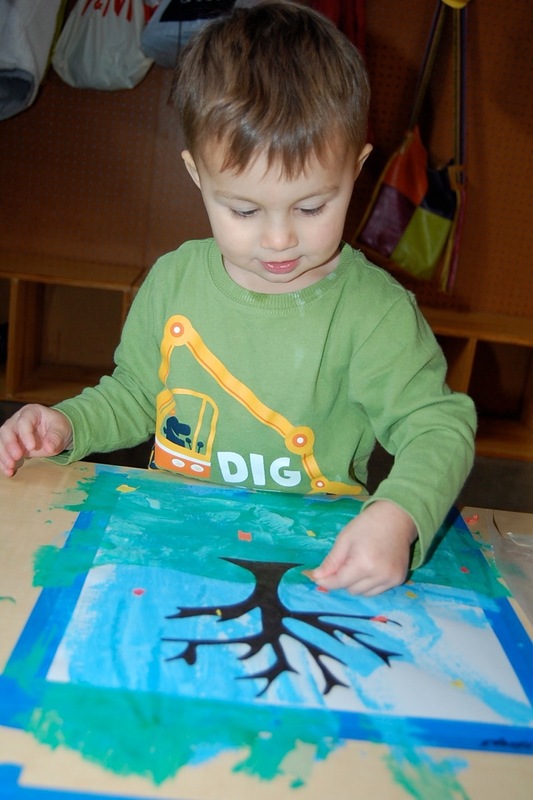 The children have been working on a fall tree painting and collage for about a week. 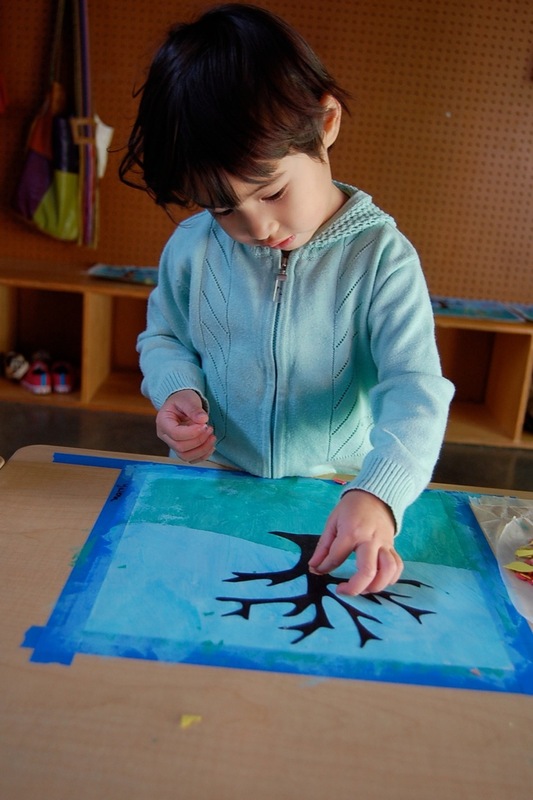 The original idea was found at Helping Little Hands: Kids’ Fall Trees Art. 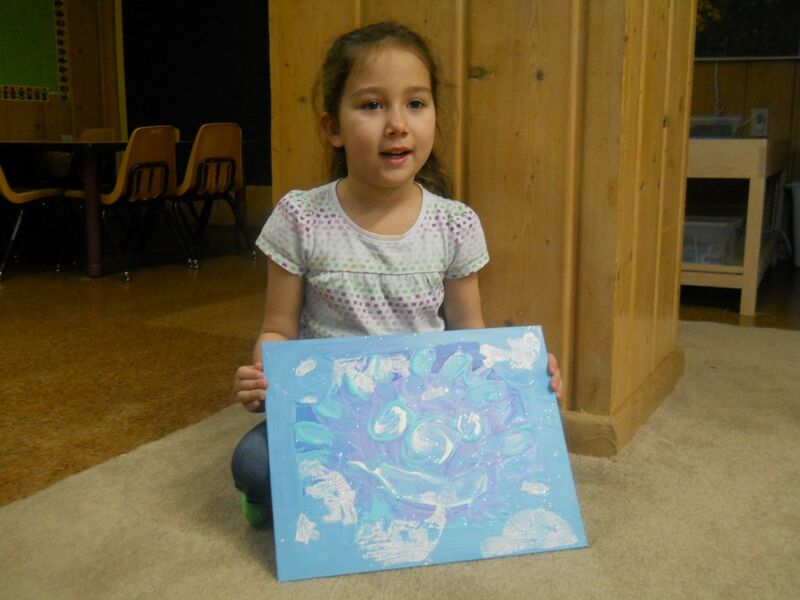 Her children’s finished product is beautiful and inspirational. All of our kids did a great job with the project. 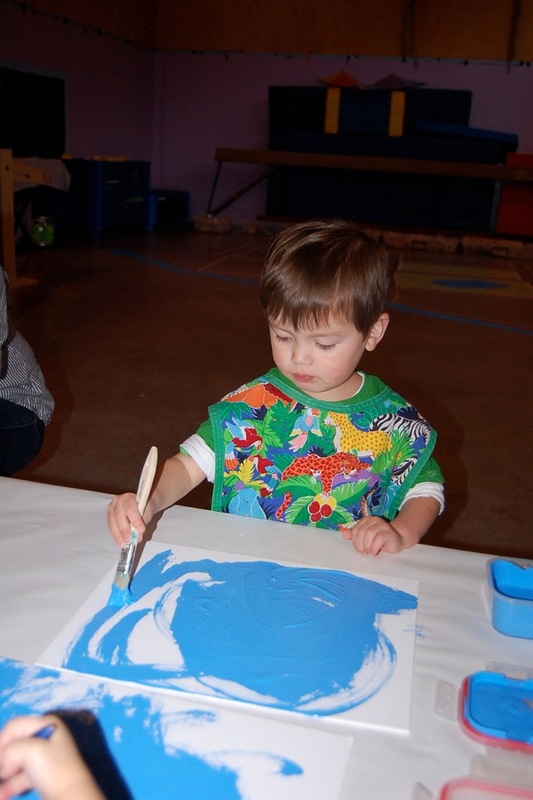 Each child was given a 12″ x 12″ piece of scrapbooking paper. 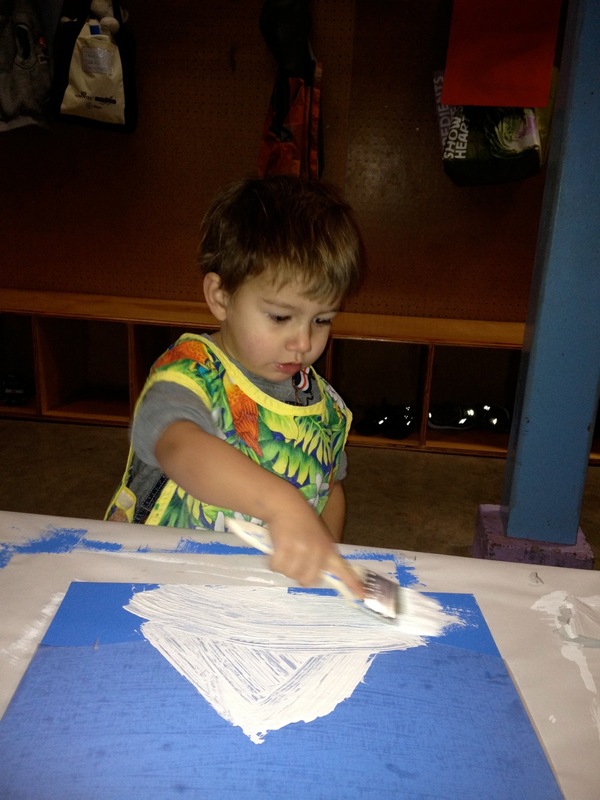 It was taped to the table using blue painter’s tape. 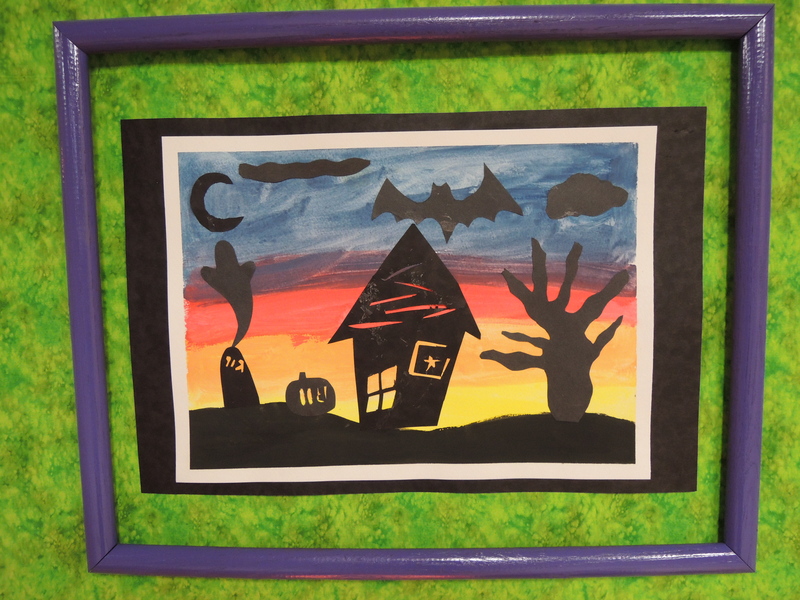 This helped the children to freely work on their projects without the paper moving, and it produced a frame around the finished product. 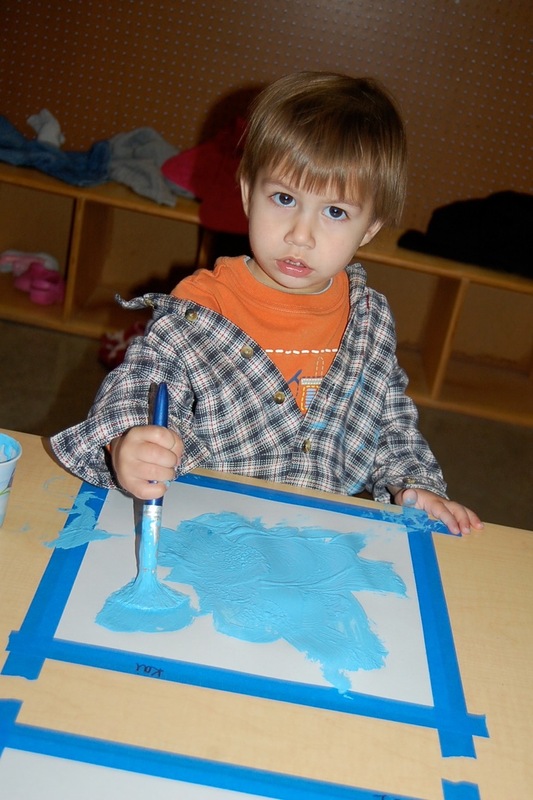 The children painted the entire paper blue. 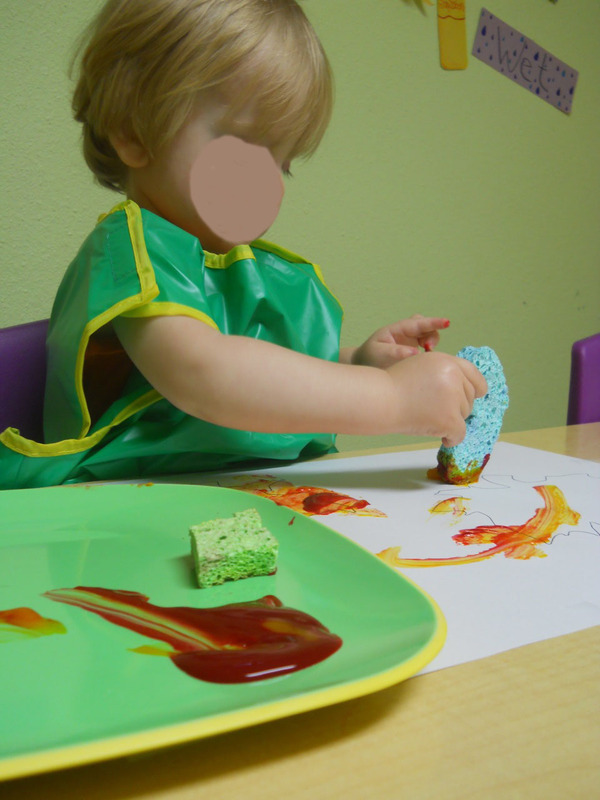 A contact paper mask was placed over the top of the picture. 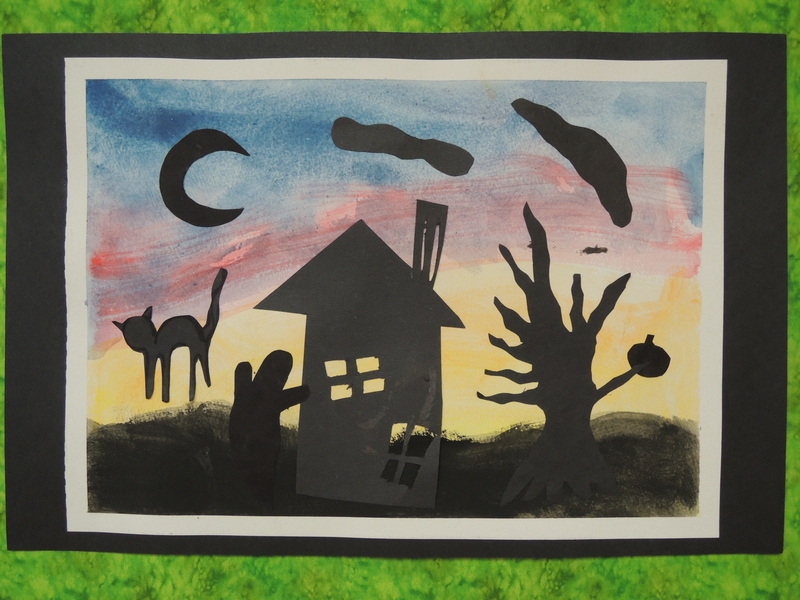 Children painted the lower half of the picture green. 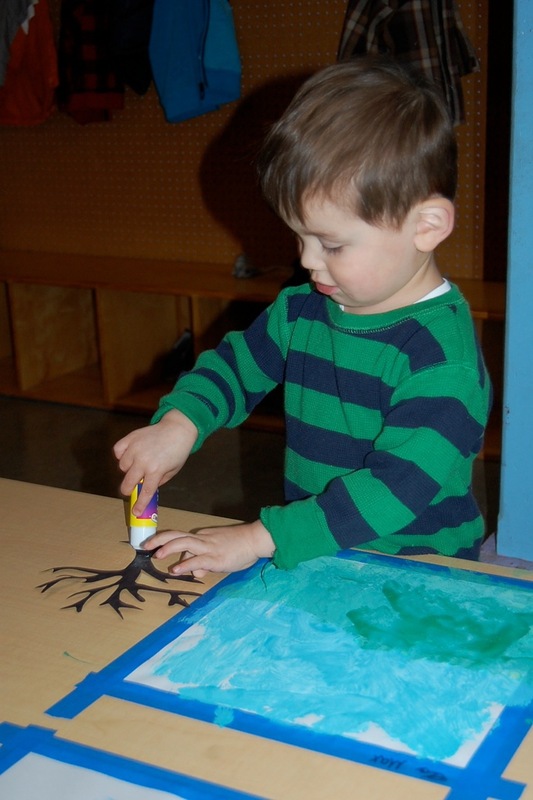 Amber cut out the trees and then the children glued them onto their pictures. 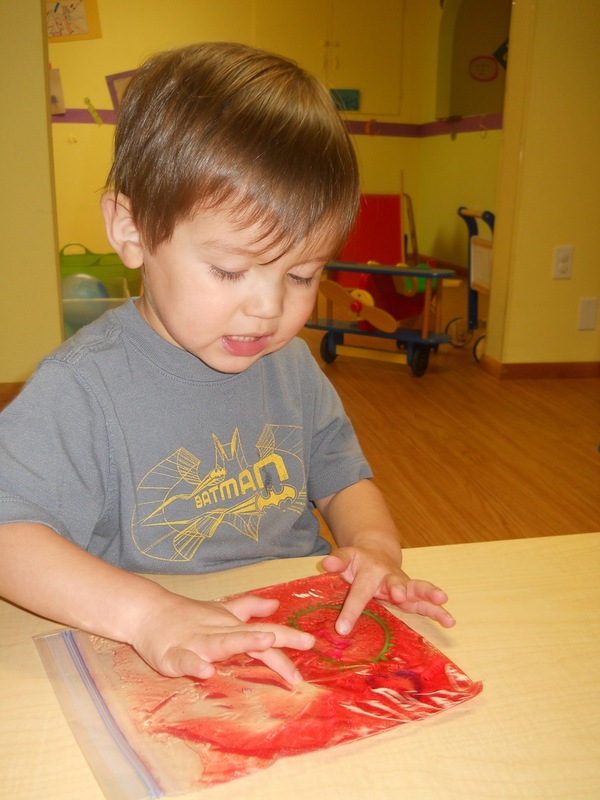 Over a couple days the children worked on tearing paper into small pieces for leaves. 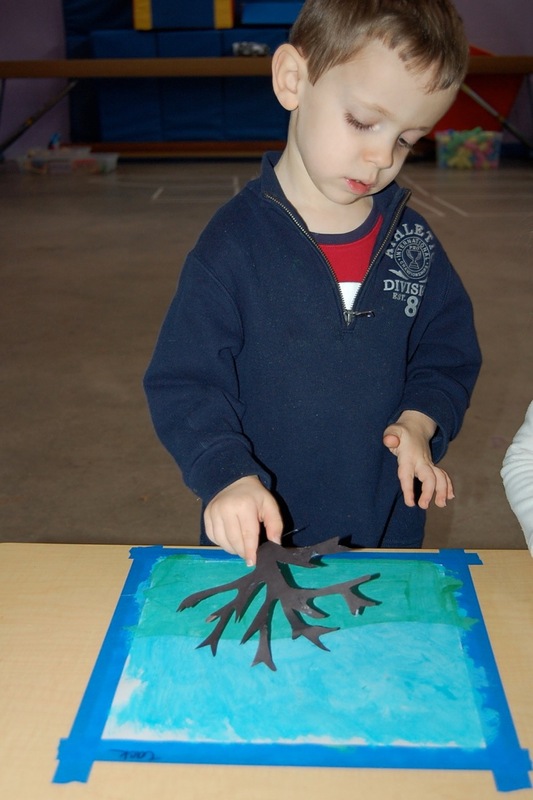 Children glued their leaves onto their pictures. 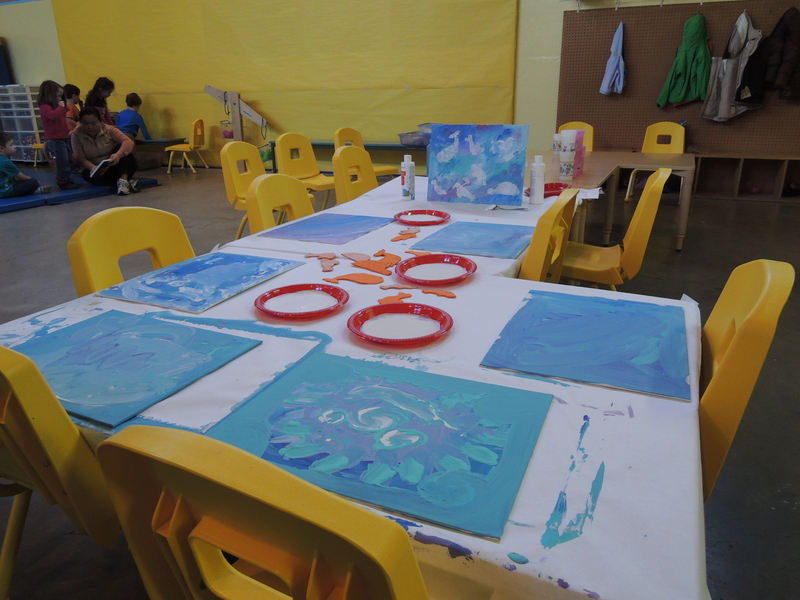 The result of doing the project over a period of time and in concrete steps insured that every child including the toddlers was able to produce a beautiful finished art product. 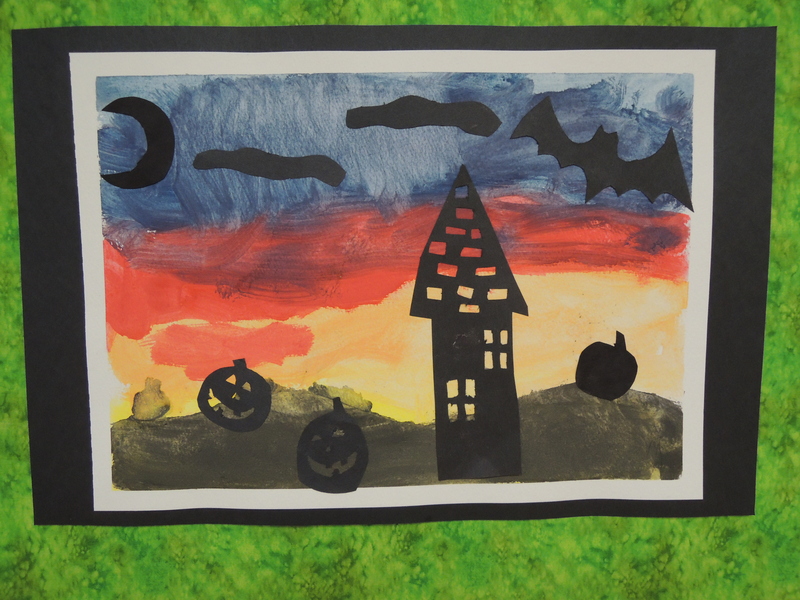 The pictures will be displayed in both classrooms. 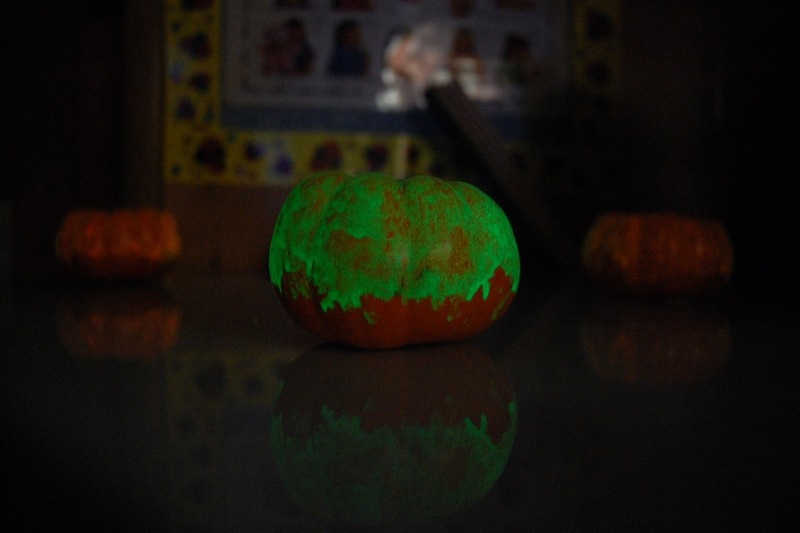 The kids went outside on a warm fall day to paint pumpkins with acrylic glow in the dark paint. 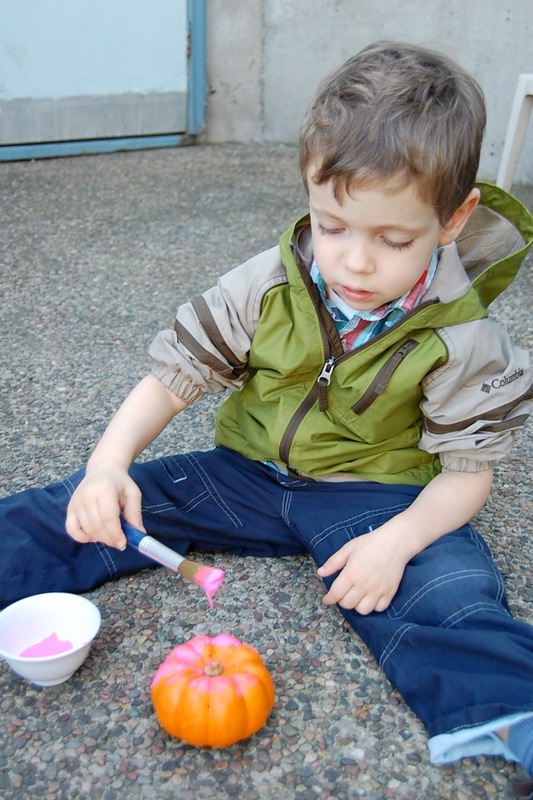 The children could choose from pink, yellow, orange, or green paint. 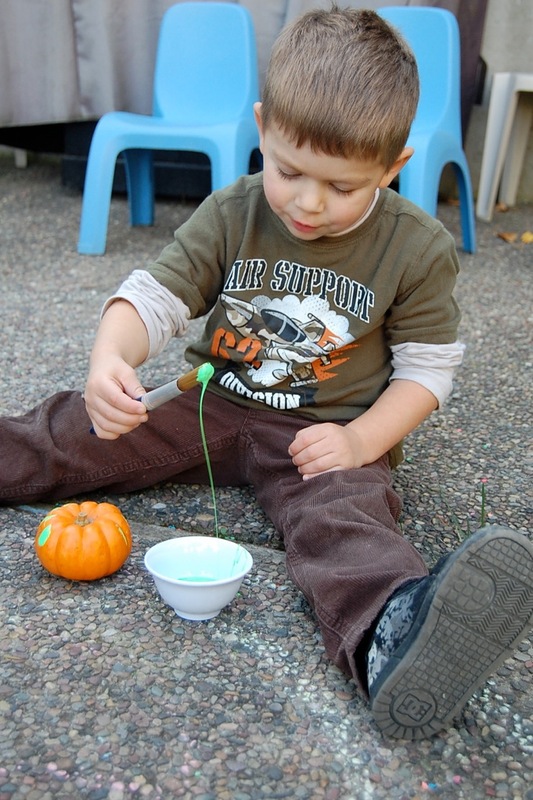 The goal was to cover the pumpkins completely with a thick coat of paint. 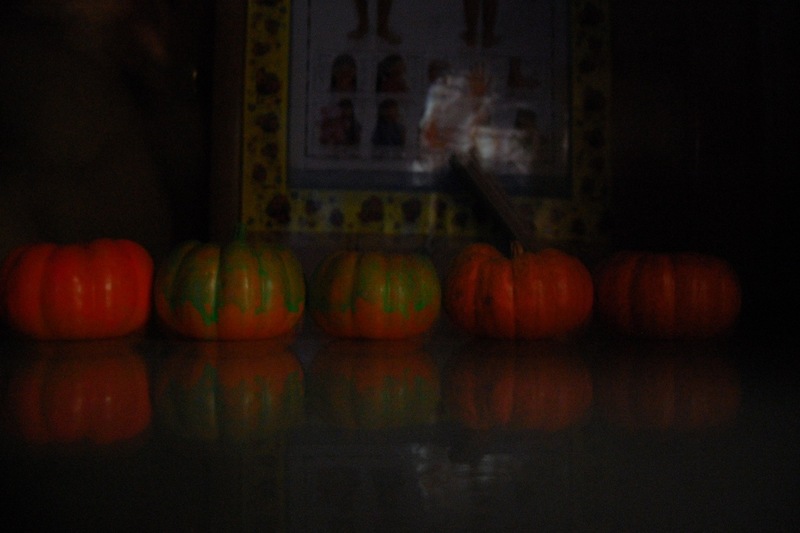 After the pumpkins dried the children played with them at the light table. 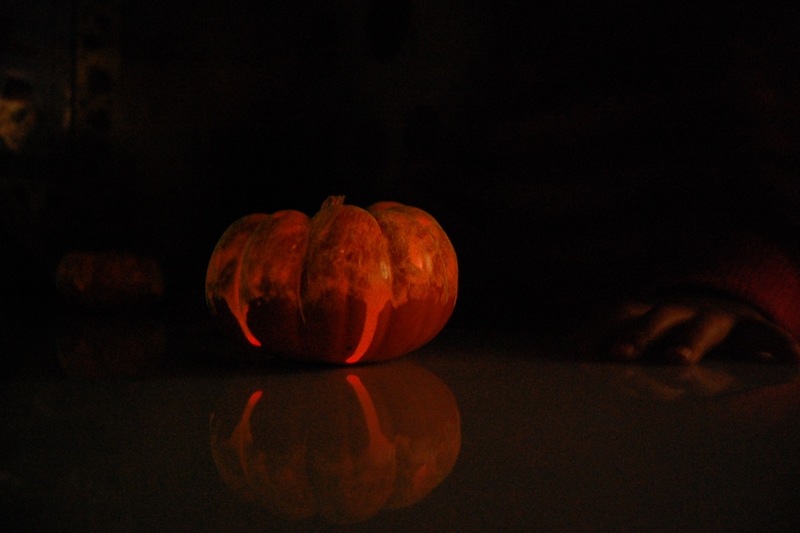 The children were fascinated with pumpkins glowing in the dark. 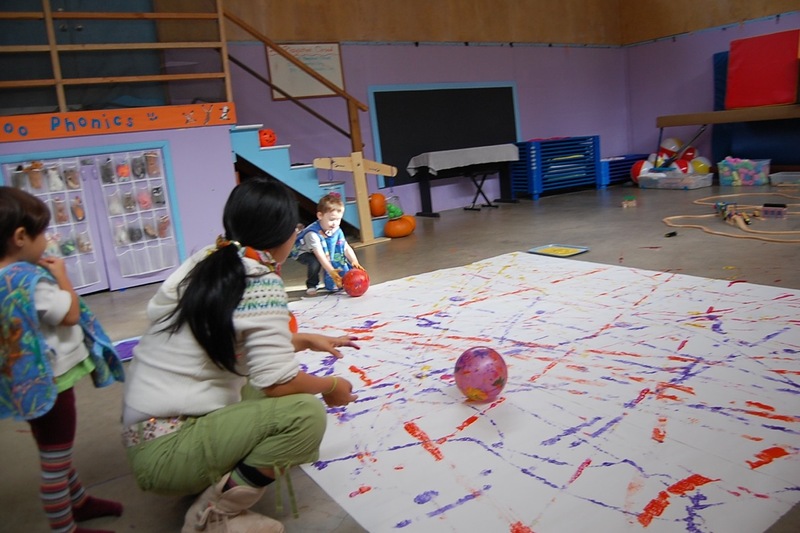 Today the children painted with balls. 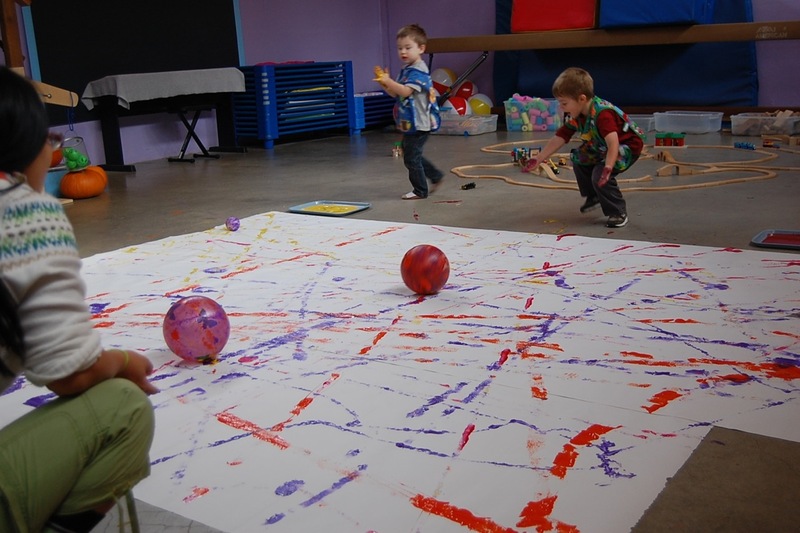 This is a very messy and great sensory activity. 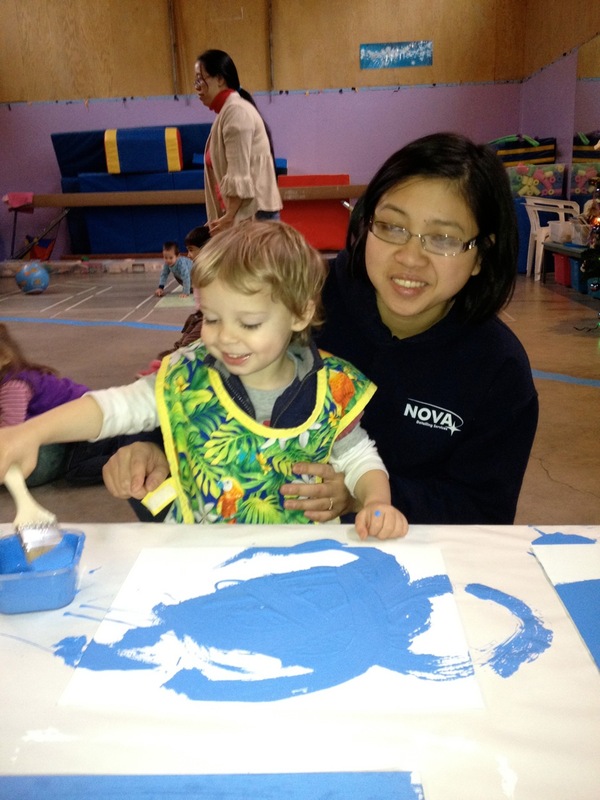 Some of the kids held back as they weren’t sure about getting their hands in the paint. 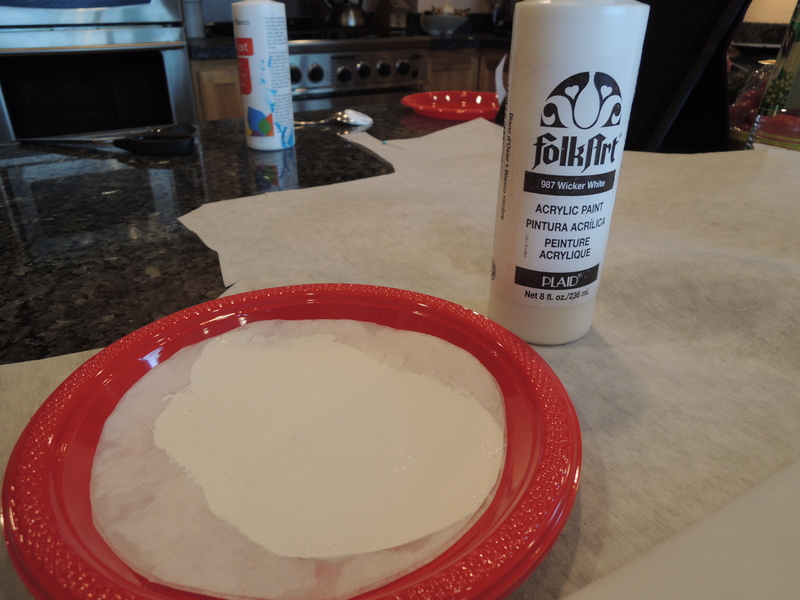 We started with a blank slate made from several sheets of butcher paper taped together. 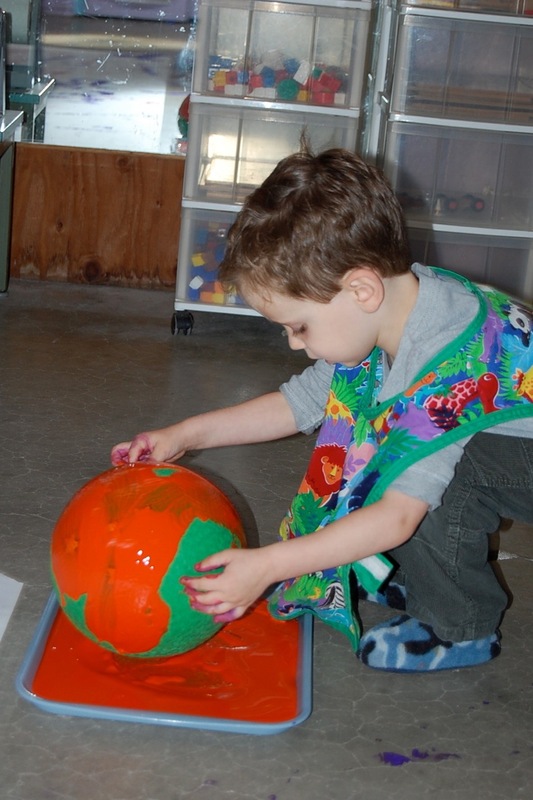 The balls were dipped into paint. 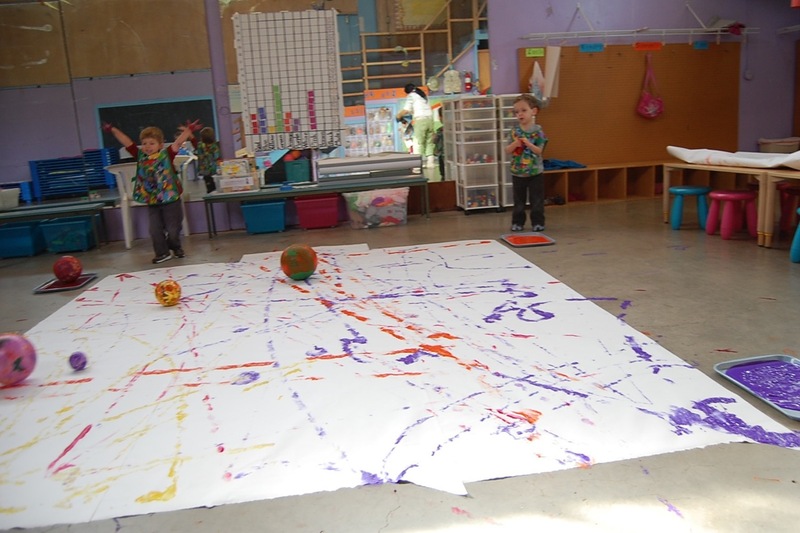 The children rolled their balls across the paper to create a wonderful painting! 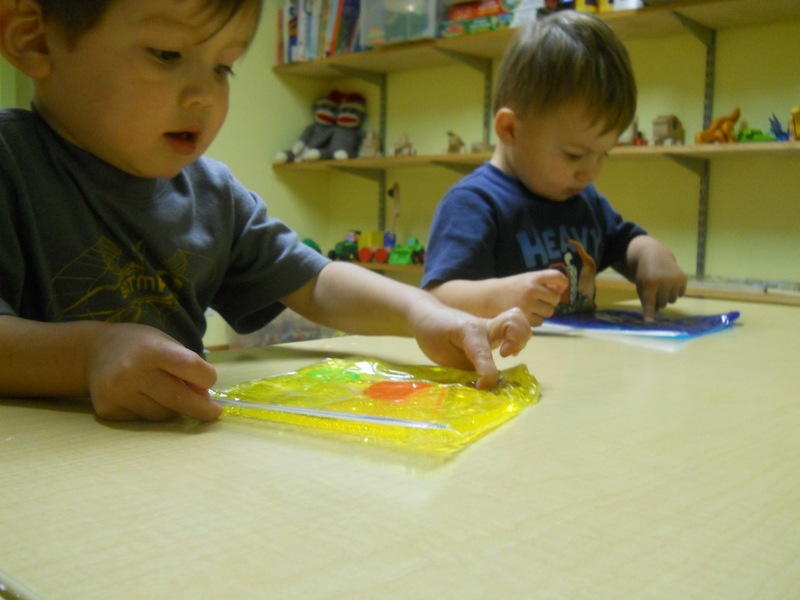 The toddlers played with gel bags. 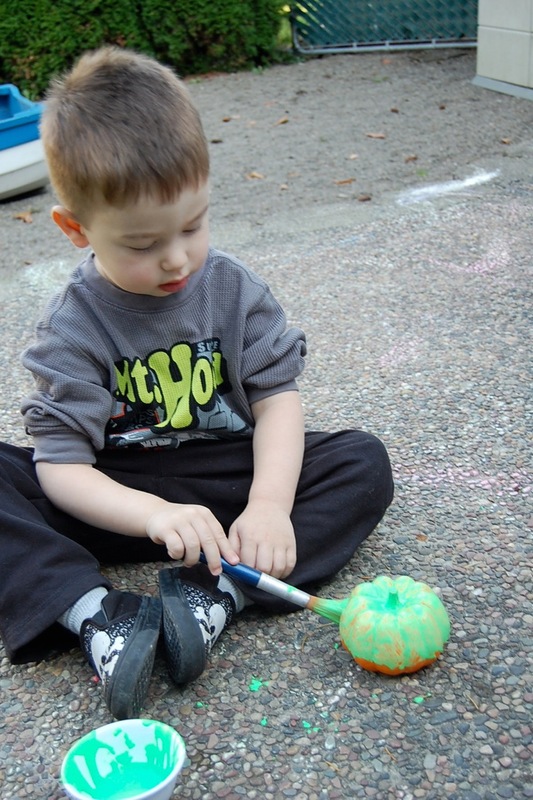 The idea was found at Teach Preschool and helps to develop fine motor skills that will be needed later for learning to write. 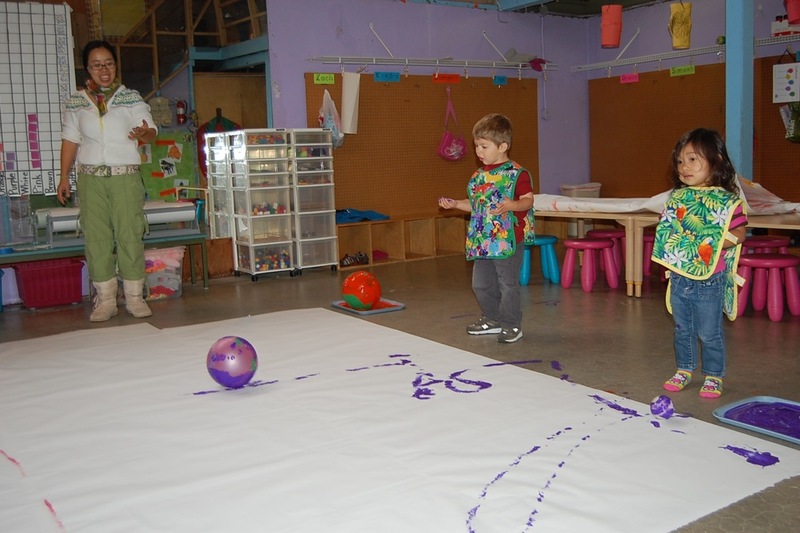 The children can draw designs on the bags or move the objects inside with their fingers. 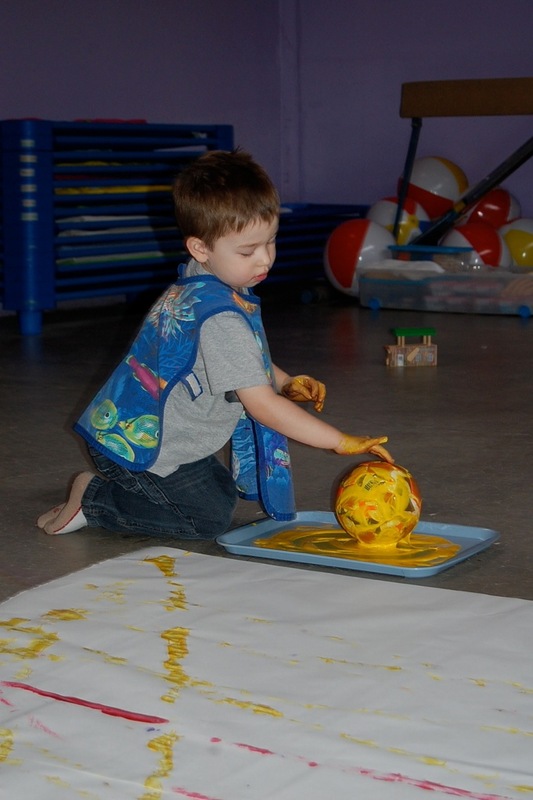 The toddler class sponge painted with red and yellow paint. 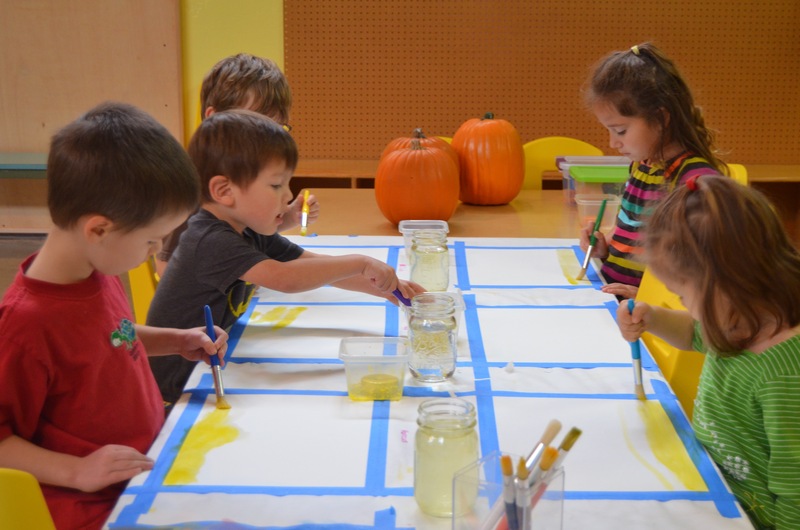 Fall leaves will be cut from the paintings to decorate their classroom.